Miyagi Prefecture (宮城県, Miyagi-ken) is a prefecture of Japan. It is part of the Tōhoku region of the island of Honshu. The capital city is Sendai. Miyagi Prefecture used to be part of Mutsu Province. That province was in the northern part of Honshu. It was made from land taken from the indigenous Emishi. The province became the largest as it expanded to the north. The ancient capital was in modern Miyagi Prefecture. During the Sengoku period, various clans ruled different parts of the province. Date Masamune was a close ally of the Tokugawa. He established Sendai, which is now the largest town of the Tōhoku region. In the Meiji period, four new provinces were created from parts of Mutsu: Rikuchū, Rikuzen, Iwaki, and Iwashiro. In 1871, Sendai Prefecture was formed. 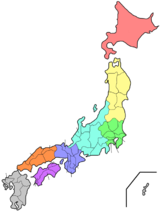 It was renamed Miyagi prefecture the following year. On March 11, 2011, a 9.0-magnitude earthquake and major tsunami hit Miyagi Prefecture. It caused major damage to the area. The tsunami was about 10 meters high in parts of Miyagi Prefecture. Farming, fishing and sake brewing are all important in Miyagi. As of March 2011, the prefecture made 4.7% of Japan's rice, 23% of its oysters, and 15.9% of its saury fish. Manufacturing around Sendai is a larger part of the economy. The area produces electronics, appliances, and processed food. Sendai Airport was badly damaged by the 2011 tsunami. Sendai was the castle town of the daimyo Date Masamune. The remains of Sendai Castle are on a hill above the city. Miyagi Prefecture has one of Japan's Three Great Views. Matsushima Bay is full of small islands with old pine trees on them. Many visitors come here every year and many artists have painted the islands. Shigogama jinja is the main Shinto shrine (ichinomiya) in the prefecture. ↑ Nussbaum, Louis-Frédéric. (2005). "Miyagi prefecture" in Japan Encyclopedia, p. 648. ↑ Nussbaum, "Sendai" at p. 841. ↑ Nussbaum, "Mutsu" at p. 676. ↑ "Japan earthquake: Tsunami hits north-east," BBC. March 11, 2011; retrieved 2012-3-13. ↑ Williams, Martyn. "Report from Japan: Impact of Tsunami Devastates Nation's Northeast," Voice of America, March 11, 2011; retrieved 2012-3-13. ↑ Japan Ministry of the Environment, "General overview of area figures for Natural Parks by prefecture"; retrieved 2012-3-14. ↑ Schreiber, Mark. "Japan's food crisis goes beyond recent panic buying," Japan Times, April 17, 2011; retrieved 2012-3-13. ↑ "Nationwide List of Ichinomiya," p. 2; retrieved 2012-3-13. This page was last changed on 20 June 2018, at 01:16.